Week 13 in the NFL began with the miraculous (and unscrupulous) way the Packers beat the Lions on a Hail Mary pass on an untimed down at the end of the game. And that game ended up setting the tone for a pretty weird weekend. And this wild, wild play where Amendola threw a pass to Tom Brady! But things didn’t quite go as planned for Brady’s squad overall. The Eagles came to play. And they ultimately beat the Patriots and gave them their second loss. There were actually lots of missed kicks on Sunday, including this one that really upset a Chiefs players on the sidelines. Also, Marcus Mariota made his game interesting with this impressive run. And that made this Titans fan very happy. And yes, he’s a pineapple. The Steelers played in prime time and made it a good show as Antonio Brown had a huge game, which included this TD celebration. So the NFL is as unpredictable as ever and the stretch run is going to be very interesting. 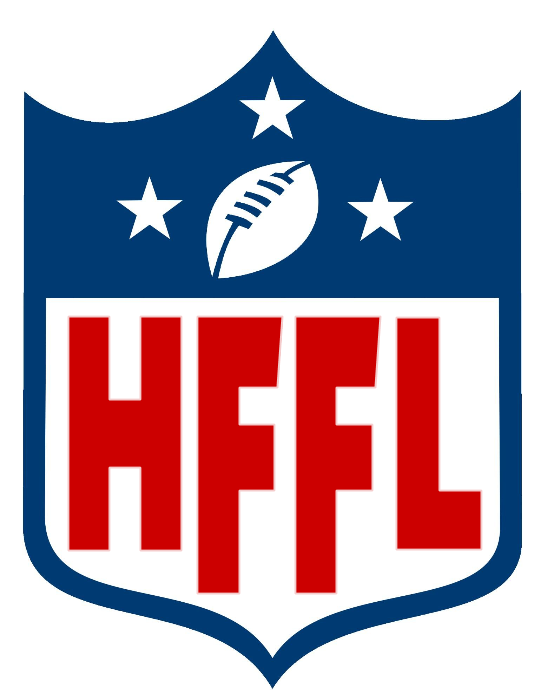 In the HFFL, this week marked the end of the regular season and we’re ready to roll into the playoffs! Who’s in and who’s out!?! Let’s find out. Well, Butterslide held up his end and prevailed over the top dog Eh Team by 13 thanks to the Denver D’s 23 points. That put Joel at .500 after 13 games (thanks to that pesky tie in week 8). Joel’s win meant that the pressure was on Tom to beat the HitMan! And it just wasn’t to be. Tom’s squad started the week with a donut from Eddie Lacy and thinks went downhill from there. Cam Newton and the rest of the Hitmen were too much for him. 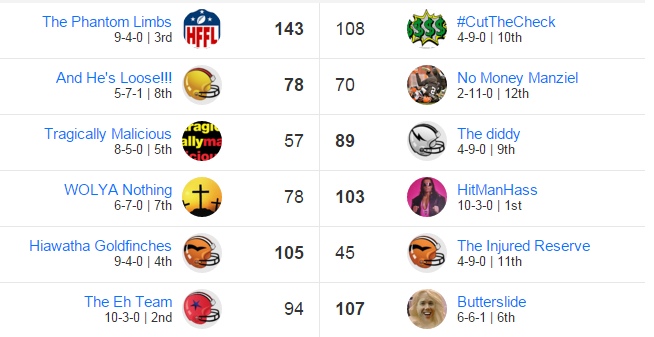 So Joel wins the final playoff spot and Tom will have a bye next week before bringing his wrath to the Toilet Bowl bracket. The rest of the LOC playoffs were done last week but for the seeding. 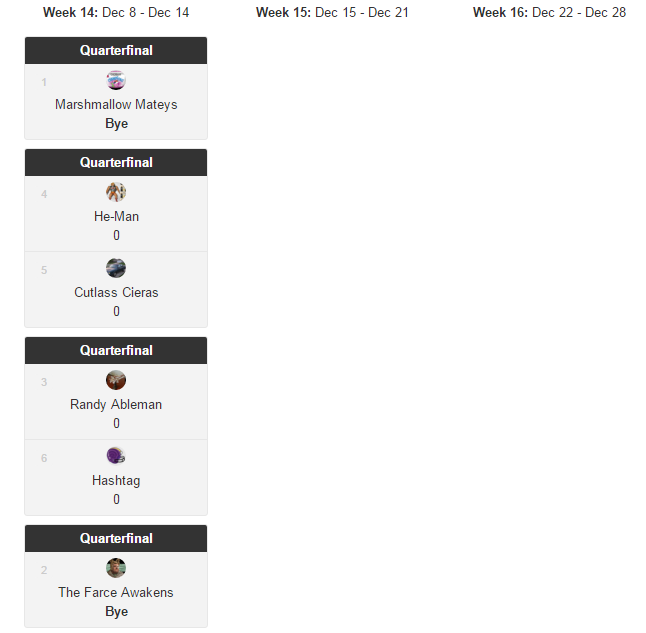 In the end, Eric’s loss to Butterslide slid him to the 2 seed, but he and Bret will still get byes in the first round. 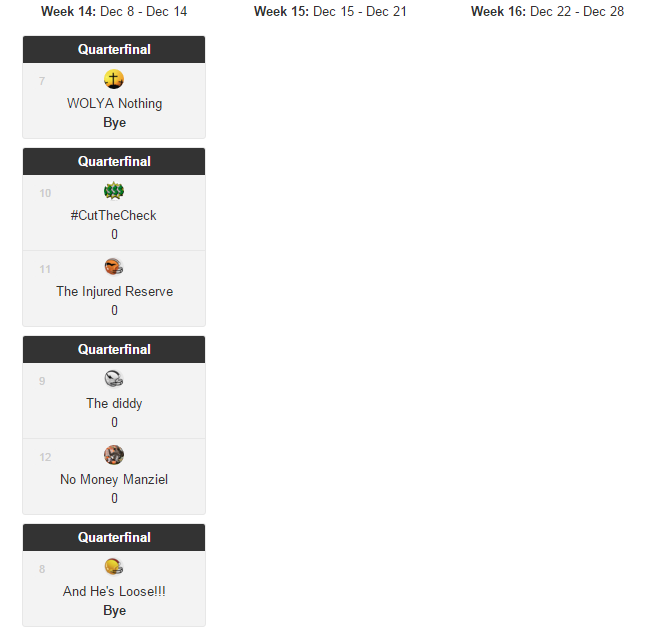 The Limbs end in the 3rd seed with a huge output this week against #CutTheCheck and end as the highest scoring regular season team. The ‘Finches crushed The IR and wound up in the 4 spot. 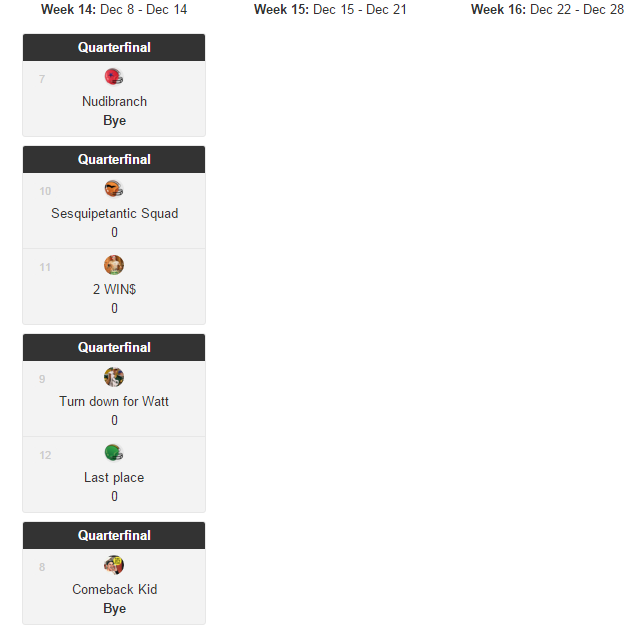 And Malicious is showing some cracks, losing his final 2 games (this week to Diddy) and falling to the 5th seed. The Toilet Bowl field is going to be just as interesting as the playoffs. Remember, the team that wins the Toilet Super Bowl wins a ticket to the LOC. So for Tom, perhaps this is actually the road of least resistance to staying in the Champs league next year! Again, it was the 6 spot that created the most drama. Two teams wanted that spot… Hashtag and Nudibranch. And guess what. They were matched up against each other in the final week. And it was a fantastic game. 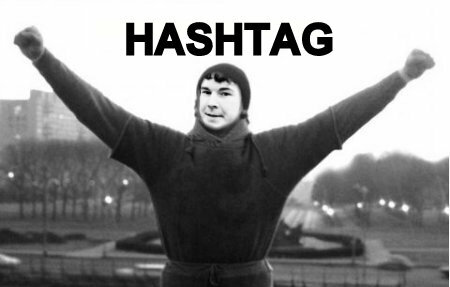 When the dust settled, however, Hashtag stood triumphant. Going into Monday night, Jon needed a miraculous 26 points from Cowboys kicker Dan Bailey. He got 15. 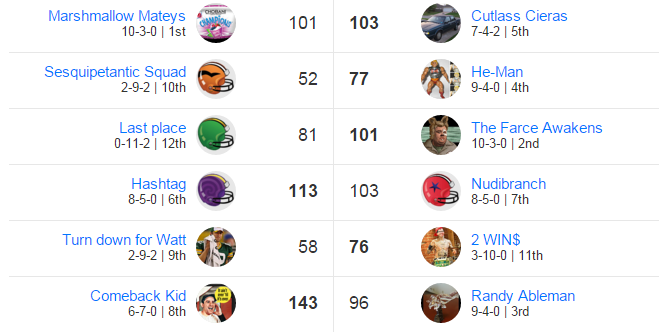 So Wayne rides a 3 game winning streak into the playoffs and Jon’s loss dooms him to fight his way through the Toilet Bowl. 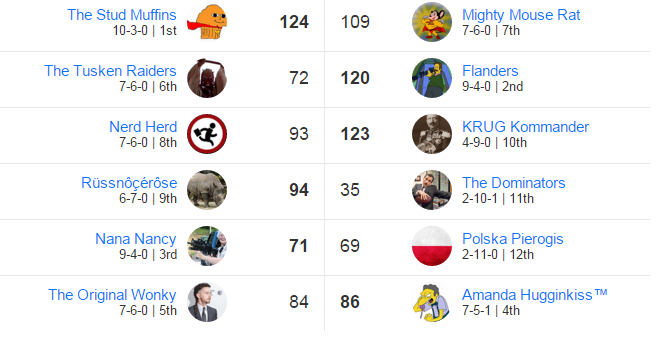 The Mateys may have rested some starters this week with the #1 seed already locked in and they took a meaningless loss to the back-on-track Cieras. 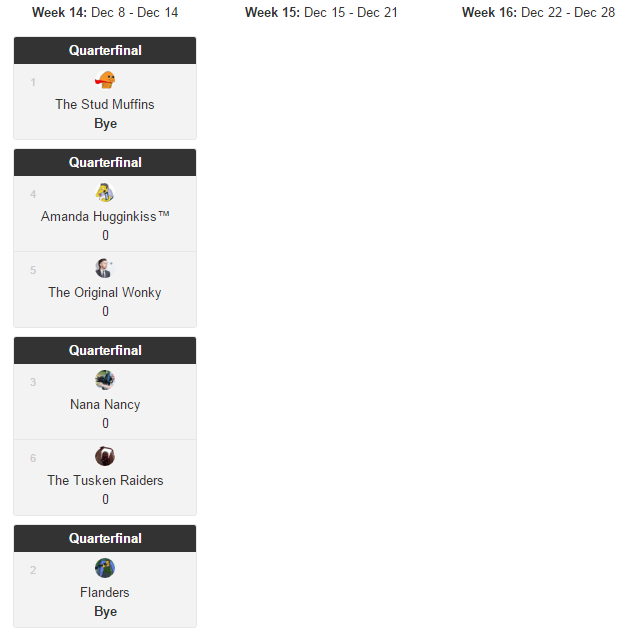 The Farce wanted a bye and they took advantage of Last Place to secure one. Meanwhile, Ableman let the Comeback kid spoil his first round bye dreams as he fell to the 3rd seed and will face Hashtag in round 1. 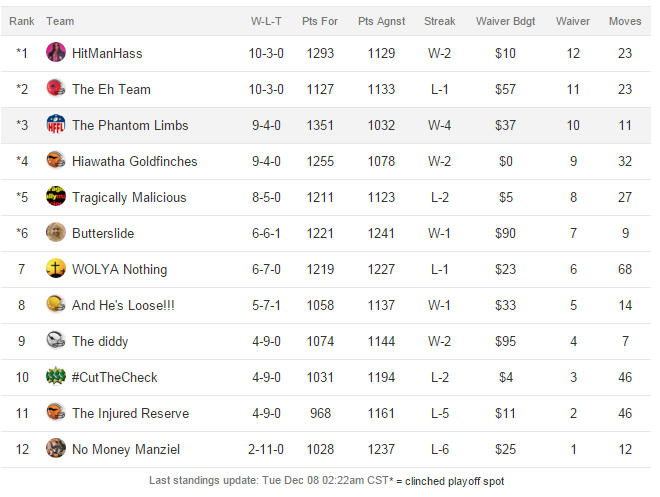 And the dark specter of He-Man and his sub-1000 points-against quietly sits in the 4 spot. In the EL Toilet Bowl bracket, NO ONE wants to play Comeback Kid right now. Caleb has a 5 game winning streak going and he’s GOT to be wondering where that fire has been all year. He’ll take next week off and hope his mojo doesn’t fade. The rest is anyone’s guess. And remember, even zero-win teams can put it together now and ride into the promised land next year! So here’s the deal: FOUR TEAM FINISHED 7-6 and one finished 7-5-1. All the 7-6 finishers lost this week. Yeah. So it all came down to total points to determine what would happen. 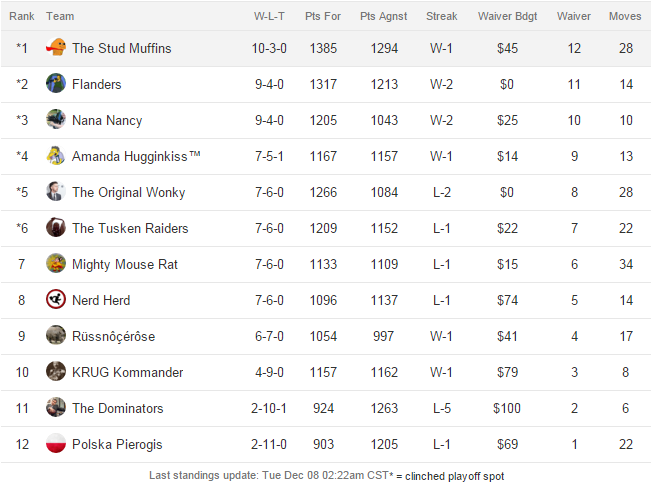 The Muffins beat Mighty Mouse Rat to go to 10-3 and get the top seed. Flanders beat Tusken to get the #2 seed. Nana Nancy also won, over Polska, and took #3. 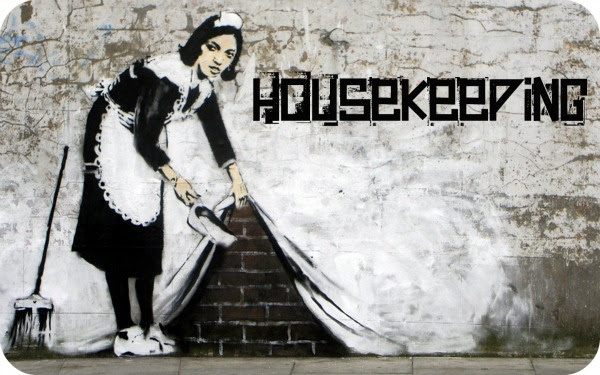 Hugginkiss edged by Wonky and get’s #4. Now it gets dicey. Wonky went down, but his point total earned him the 5 spot. 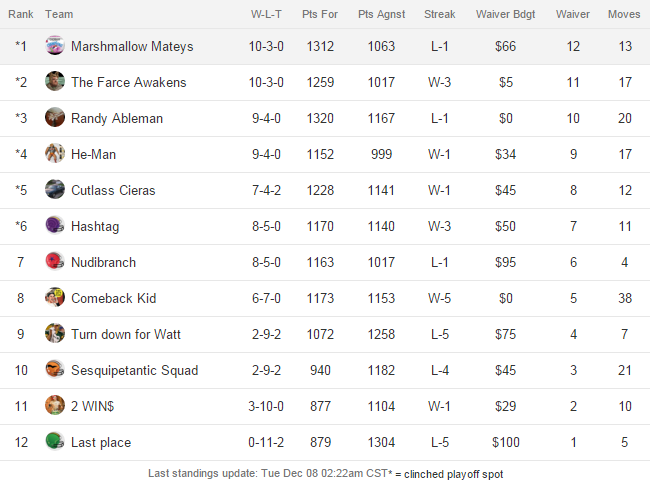 The Raiders 1209 points were enough for the 6 spot. Meaning that Luke and Bob, with their losses and lower total points, are out. If any of these teams had won this week, they would have been the #4 seed. So a couple of teams that easily could have been playoff bound will, instead, take next week off to let their anger build and then take out their frustrations on the lower 4 teams and try to win a golden ticket in the Toilet Super Bowl. But wait! Also in the Toilet Bowl is… KRUG. Denny has the highest total points in the PL Toilet Bowl bracket and just scored 123 this week. Could his 4-9 team make some noise and crush some dreams? Who knows!? For Wayne, it was win and in. And he won! Wayne’s team has been a darkhorse for a few weeks now and he’s posied to make some noise in the playoffs now. If history is any indicator, it’s not the regular season success stories that prevail in the playoffs, it’s the teams that peak at just the right time. Look back at our historical stats to see some 6 seeds that have won it all. Is that Hashtag this year? It’s playoff time! This is not the time to be asleep at the wheel with your rosters. This is the time to put the pedal down and go for the gold! A loss this week is the end of the line for your LOC dreams! Remember, Thursday night this week is the Vikings and the Cardinals! That’s where the first playoff points will be scored! For a refresher on playoff scenarios and LOC advancement, check out the Rules page. 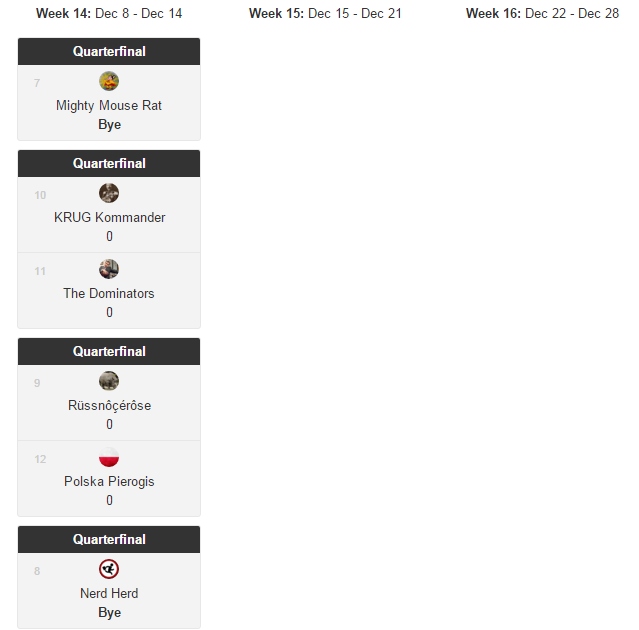 Also, check out the final SuperStandings to see how your team slotted in in the grand scheme of the HFFL universe this regular season! As an added stat factoid, I tallied up the weekly points of each league through the regular season and determined that Premier League was the highest scoring league this year, edging out the LOC by just over 100 points! Well done, PLers! 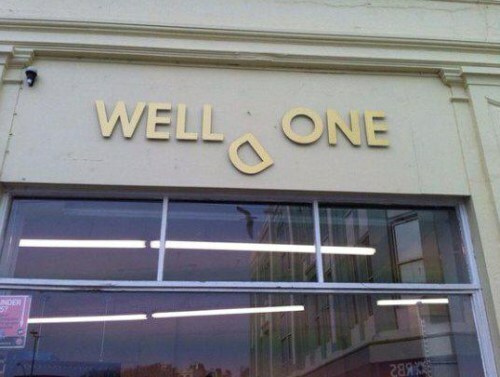 Whew, if you made it this far, you’re a star. 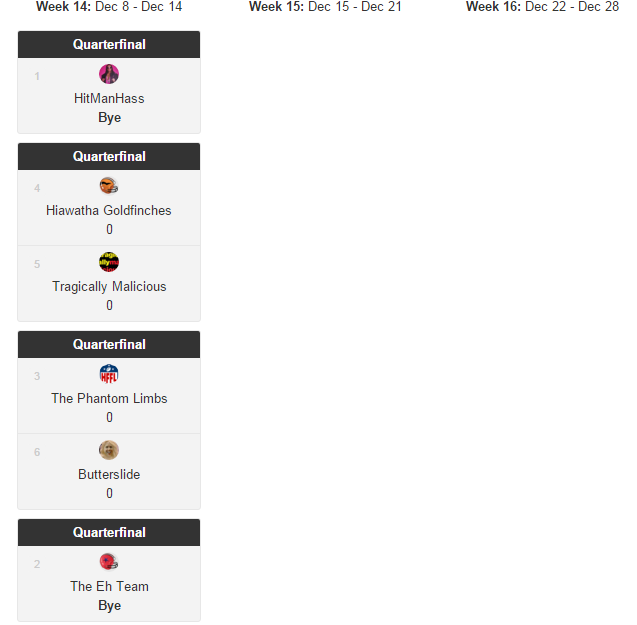 Next week, the playoffs begin and with a bunch of teams on bye, the schedule will be light. Good luck, gentlemen! You’re going to literally need it.